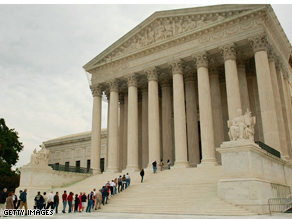 The Supreme Court has rejected an appeal that questioned Obama's eligibility to be president. WASHINGTON (CNN) - The Supreme Court has rejected an emergency appeal from a retired lawyer in New Jersey who questioned Barack Obama's eligibility to be president, because he had dual British-American citizenship at birth. The justices without comment on Monday refused to intervene in the November 4 presidential election, dismissing the claims of Leo Donofrio, a resident of East Brunswick, New Jersey. In his appeal, Donofrio claims that because Obama's father was a Kenyan-born British subject, the president-elect does meet the Constitution's requirement that the president be a "natural born citizen" of the United States. Obama was born in Hawaii in 1961. His mother was a U.S. citizen, born in the United States. Many legal analysts questioned Donofrio's argument. "The law has always been understood to be, if you are born here, you're a natural born citizen," said Thomas Goldstein, founder of the Scotusblog.com Web site, and a lawyer who has argued numerous cases before the high court. "And that is particularly true in this case, when you have a U.S. citizen parent like Barack Obama's mother." In another lawsuit making its way through the courts, Philip Berg of Pennsylvania alleges the president-elect was actually born in Kenya. Berg claims Hawaii officials will not let him see Obama's original birth certificate, although the campaign posted a copy of it online this summer, following numerous blog postings over the citizenship question. That case had previously been dismissed by lower federal courts. The appeal rejected Monday is Donofrio v. Wells (08A407). Let me guess. You received your information from an email that was forwarded to you from God-knows-where or from some internet site written by someone you don't know, who has no first-hand knowledge of any evidence, but was instead "told" such-and-such, right? Because that is so much more likely to be accurate than reports in the legitimate press or statements by the State of Hawaii verifying that Obama was born in Hawaii, or an investigation by factcheck.org, an independent political fact-checking organization? Because of course it's far easier to believe that State of Hawaii would want to be complicit in a cover-up, or that Obama's grandparents would have placed a birth announcement in an Hawaiian paper at the time of his birth knowing, what, 48 years ago, that their bi-racial grandson would grow-up to run for President and that they would need to try to prove that he was born in Hawaii when he was actually born in Kenya. And that journalists - who, whatever you believe about their leanings, are really only motivated by one thing, the BIG STORY - would conspire to kill the BIGGEST STORY this side of who killed Kennedy, and that the Supreme Court would also be involved by striking down the court case. Yep. That's SO much more likely. You might want to loosen your tin-foil hat, sport. The Supreme Court made the correct decision. This complete nonsense by the lunatic fringe of the right must come to an end. The election is over. And, for that matter, Barack Obama's opponent John McCain was born in Panama which makes John McCain a United States Citizen "born abroad" and not a "natural born citizen". My fellow Americans..in the coming months and years we will see these old cronies and status quos try to pour Haterade on this new era of Change..don't believe the HYPE! I guess when he was Senator it did not matter but now that he is President elect Obama some idiot is attempting to question his citizenship. How stupid. I was born here and also my parents, however, we came from Africia and if my son, grandson became President of the USA would that make him not a citizen of the USA? "The constitution nowhere defines the meaning of these words ["citizen" and "natural born citizen"], either by way of inclusion or of exclusion, except in so far as this is done by the affirmative declaration that 'all persons born or naturalized in the United States, and subject to the jurisdiction thereof, are citizens of the United States.'" This case alone sheds like that this lawsuit is bogus. Yes it was brought by a Democrat, but who cares? He's an idiot. The director of Hawaii’s Department of Health confirmed Oct. 31 that Obama was born in Honolulu. Find another conspiracy already. Can any of you Morlocks produce your own original Birth Certificate? No you can't. You can only get a certificate of Live Birth. The state keeps the original. You subterraneans really annoy surface dwellers. Also, Obama's birth certificate (aka Certificate of Live Birth) is posted in a gazillion places on various websites. For all those who say "let's see it", go see for yourself. And please keep in mind that all birth certificates are not the same. The one posted mirrors that of other Hawaiian-born citizens. For those who say: "show me the original", well I couldnt' show you my original. I believe it disintegrated (i.e. fell apart) it was so old! So I, like millions of others, including Obama, had to order a new one from Vital Statistics. They have an original on file, but it is not a document that can be obtained by a someone just wanting to see. Obama can't even receive the original. So please, enough with the conspiracies! The interesting thing is that a lower court BLOCKED the viewing of Obama's birth certificate at his request. What does Obama have to hide???? The simple thing to do is to display it and ALL of these questions are either answered OR they go away. It this keeps coming up during his presidency, it could make him none effective. I can't understand why these folks don't go onto the snopes and factcheck web sites to see for themselves. By the way, the phrase is "to all intents and purposes" not "intensive" as some of you seem to use it. Hawaii isn't the "Real America" or conservative enough for the Neo-Con's? The people have a right to know if their President fits the Constitutional requirements. I think Obama is most likely qualified. I say likley because his COPY of a certification of birth does not mention hospital or attending physician and that raises some questions. Then there is the question about how he traveled to Pakistan in the 80s when they did not llow US citizens to enter. If he qould just answer these questions, and release his college records like McCain did, I for one would be more convinced. Get a life people. The right wing bag has clearly run out of tricks. Put yoursef to good use and for once start being the solution to the dire problems facing this nation. You know those problems that your "hero" W helped create and spiral out of control? Why not roll your sleeves and start working to get this country back on track instead of constantly looking for road blocks. I am still waiting to hear the solutions you have for this country other than simply opposing anything Obama and dems say. We are tired of parties whose slogan is oppose, oppose and oppose! Help solve things for a CHANGE! The 12th amendment to the US constitution states, and I quote"It is generally agreed that these constitutional provisions mean, anyone born on American soil to parents who are citizens is a "Natural born citizen". Elegible to someday become president. End of quote. Mr. Obama was born from a US citizen mother and of a Non US citizen father. That's make Mr. Obama not elegible to become president. Let's see: John McCain born in..Panama. That's not part of the 50 states. All you right-wing religious zealots, go skinny dipping of the coast of Alaska, i'm sure Sarah Falin will allow it. All of you who question Pres-Elect's change: You're reading between the lines, he's changing Policies that Bush ruined. John McSame voted the same as Bush 90% of the time, including the War. Yeah, some change that geezer would have brought if he stayed alive, since he's 78.